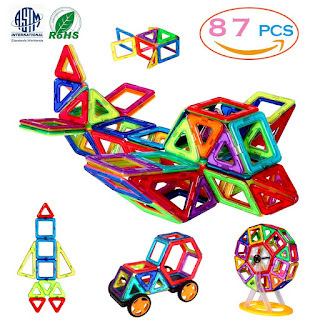 Hop on over to Amazon where you can score this Manve Magnetic Blocks 87-Piece Set for only $27.99 shipped when you use promo code FI8BHXVL at checkout! This set comes with 2 cars and a ferris wheel, 36 squares, 30 triangles, 4 long triangle, 2 Hexagons, 1 three times square and an idea booklet. Plus, it is totally compatible with other similar-sized tiles like Magformers and Picasso. Let your kiddos use their imagination to build all kinds of fun creations, or they can get inspiration from the included booklet.